Summary BYOD eight-bay Intel D2700 Atom RAID SATA NAS with many serving options. 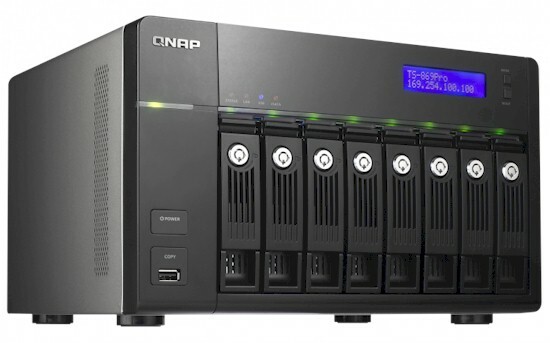 QNAP's TS-869 Pro is a eight-bay version of the five-drive TS-569 Pro I reviewed last October. Like its smaller sibling, the TS-869 Pro is based on Intel's dual-core D2700 Atom processor. From the front side, the TS-869 Pro looks like strikingly similiar to the other recent QNAP NASes, adding three drives to the TS-569 Pro's profile for a wider stance. The front panel has a USB 2.0 port vs. the blue USB 3.0 port found on the QNAP TS-559 Pro II. On the rear there is an ample selection of ports. An HDMI port (for console access and HD Station), two blue USB 3.0 ports, dual eSATA ports, dual Gigabit Ethernet ports and four USB 2.0 ports. Inside the TS-869 Pro is exactly the same as the TS-569 Pro with the addition of a third Marvell 88SE9125 SATA 6Gb/s and PATA Host Controller on the backplane for the additional drive slots. And when I say identical, I mean that both NASes use the same exact board, marked TS869-PRO in the photo below taken from the TS-569 Pro review. I've included the key component information in the table below, for pictures and more detailed information please see the TS-569 Pro review. The NAS was equipped for testing with four Western Digital Red 3TB drives (WD30EFRX) supplied by SmallNetBuilder. Power consumption measured 48 W with the 4 drives spun up and 33 W with them spun down. Fan and drive noise could be classified as medium-low, with most of the noise coming from the drives. Firmware at test time was 3.8.2 Build 20130301. This version includes the MyCloudNAS feature and ElephantDrive cloud backup option. This version has added another cloud-based storage feature: Symform. Symform lets you allocate a portion of your QNAP NAS in return for free cloud storage. It's also available for Windows, MacOS and Linux (beta) systems so you can share some of your storage there. We covered MyCloudNAS in the TS-112 review. For a run-through of V3's other features, see the review or the online demo.